Residents of Queensland, Australia are being warned about the dangers of flood waters which may contain crocodiles, snakes and even torrents of human feces unleashed by the monsoon rains in the region. 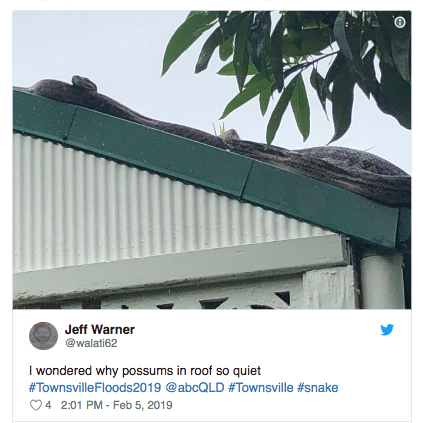 After several deadly aquatic reptiles were spotted in and around the city of Townsville, state authorities issued a number of warnings on Monday. 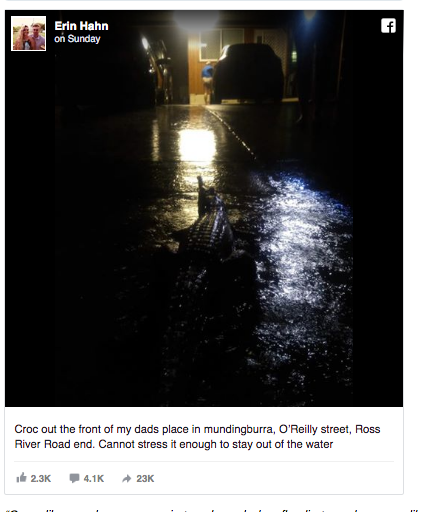 Locals are being advised to watch out for crocs and serpents in the most “unexpected places” as emergency crews continue to deal with the rising water levels. Those who come across the dangerous reptilians are being advised to stay clear of the animals and contact authorities. Contaminated Queensland’s waters may also hide unsanitary and unhealthy substances, including human excrement from untreated sewage in the area. “If the thought of coming face to face with a crocodile isn’t deterrent enough, before you start playing in flood waters you should always remember the distinct possibility you could be wading in your neighbor’s feces. Yes. Their feces,” Queensland Police said in a statement. Much of Townsville remains underwater after authorities deliberately opened the floodgates of the Ross River Dam on Sunday night after the reservoir swelled beyond capacity amid unprecedented rainfall in the region. The Townsville City Council estimates up to 2,000 properties may have been affected by floodwater. Schools, daycare centers and businesses have been closed throughout the region. The army was called into the city to help with evacuations. Emergency workers are using boats and helicopters to rescue residents from the “once-in-a-century” flood. 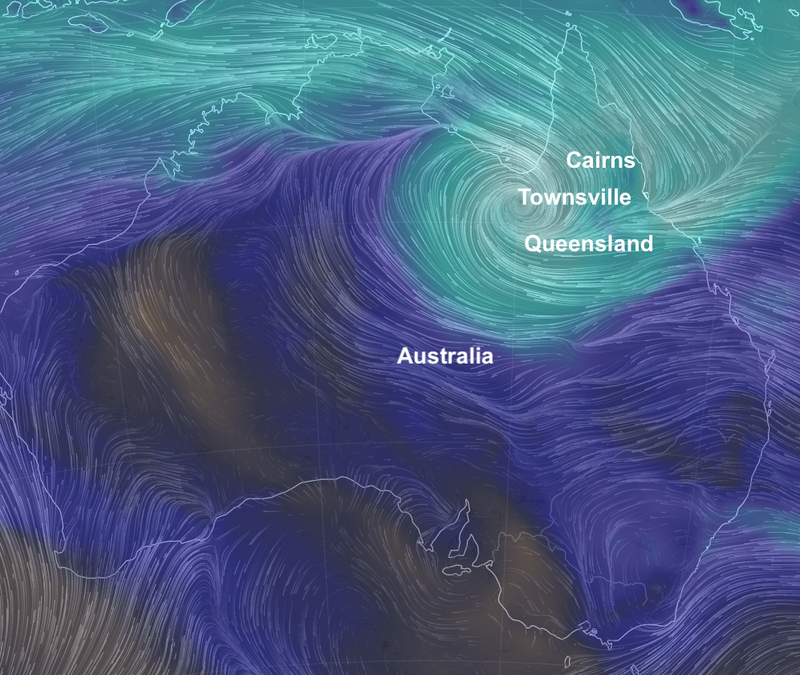 Warnings of severe weather conditions remain in effect across parts of the Australian state on Tuesday, with “intense and significant” rainfall expected throughout Queensland. Flood dangers and travel disruptions are expected to continue throughout the week. A record 1.16 meters (3.8 ft) of rain has fallen across the Townsville area over the past seven days, with another 100 millimetres expected to be dumped over the area on Monday. Once in a century event happening here, it's historic. Major flooding threatened several thousand homes on Monday in the Australian state of Queensland, forcing more than 1,100 people to be evacuated, after authorities opened up dam gates after days of torrential rains filled reservoirs to overflowing. “Once in a century event happening here, it's historic. 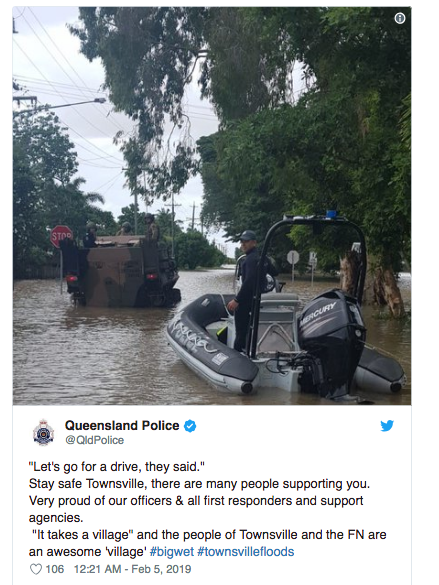 I have never seen the likes of this before,” Queensland state Premier Annastacia Palaszczuk said in an interview on Australian Broadcasting Corp TV, in a state often hit by cyclones and flooding. Palaszczuk said there could be thousands of homes affected by the flooding. According to Reuters, a record 1.16 meters (3.8 ft) of rain has fallen across the Townsville area over the past seven days, with another 100 millimetres expected to be dumped over the area on Monday, the Bureau of Meteorology said. Once-in-a-century flooding in northeast Australia looks set to worsen as the rain continues to fall. Homes and businesses in the coastal city of Townsville were destroyed as flash flooding washed through streets, sweeping away cars and livestock. The rain also triggered landslides, which blocked roads and damaged buildings. Approximately 100 families had to be evacuated from their homes and that number looks set to rise as the deluge continues. Queensland Fire and Emergency Services Commissioner Katarina Carroll said Friday night had been a busy night for emergency services. This is more than the city would normally be expected in the whole of January and February combined, the wettest months of the year. The Ross River Dam is now at 212 per cent capacity, three times the volume of water that was in the dam on January 27. The high water level has prompted the authorities to increase the runoff from the dam which, in turn, has triggered further flooding in parts of the city. More heavy rain is forecast over the coming days and, despite the army sandbagging southern parts of the city, conditions are expected to deteriorate further. Another 20,000 homes are likely to be affected in the next 24 hours, a significant proportion of the 90,000 homes that are in the city, and Townsville Mayor Jenny Hill urged people to "self-evacuate" and not leave it too late.